The set includes A box of No. 20 biscuits. 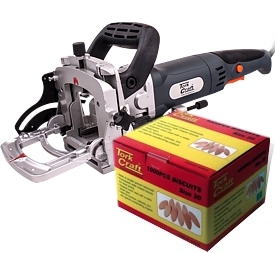 A biscuit joiner is a woodworking tool used to join two pieces of woodtogether. It uses a small circular saw blade to cut a crescent-shaped holein the opposite edges of two pieces of wood or wood composite panels. An oval-shaped, highly-dried and compressed wooden biscuit (made from beech wood)is covered with glue, or glue is applied in the slot. 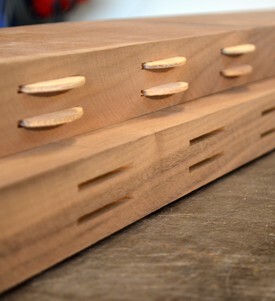 The biscuit is immediatelyplaced in the slot, and the two boards are clamped together. The wet glueexpands the biscuit, further improving the bond. The grain direction on the biscuits are diagonal to add strength to thejoinery. The biscuit provides a quick means of getting a perfectly flush joint,while at the same time reinforcing the joint. Biscuits may also be referrred to as plates.